In model target using unity how to adjust the dimensions of the model? Hi I was developing a simple model target for testing.I uploaded the cad data which is .obj file into the vuforia model target generator.After generating the target ,I imported the package into unity.Initially I did not adjust in the dimensions in the inspector.The guide view was so small.The object was not tracked.So in the inspector I adjusted the physical length,width and height and guide view mode to guide view 2 D .When I took the build in device still the the guide view was so small . Original (Physical) dimensions of the model is 10 cm x 5 cm x 5 cm.How to adjust the correct dimensions in unity according to Physical model measurements.I am using SAMSUNG S7 .We can test model target only using Android devices? 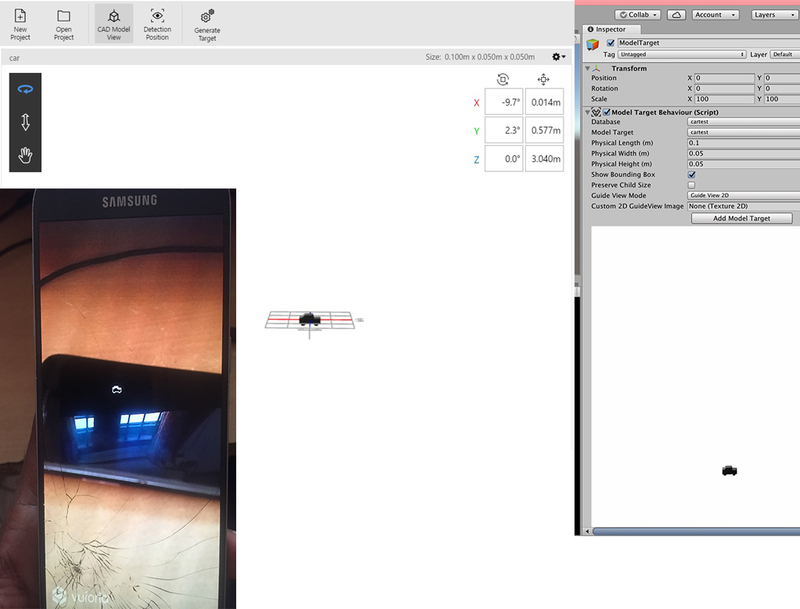 Indeed, in yourMVG screenshot you can see that your are 3 meters away along axis Z and 0,577m away along axis Y. Try to zoom in the MVG view so that you are less than 0,200m on each axis before creating your snapping position. It looks like you probably set the guideview in the tool to be very far away. Could you share a screenshot of the detection position you set in the MTG?